I admit that this is not an ordinary burger - it is my take on a chicken burger. 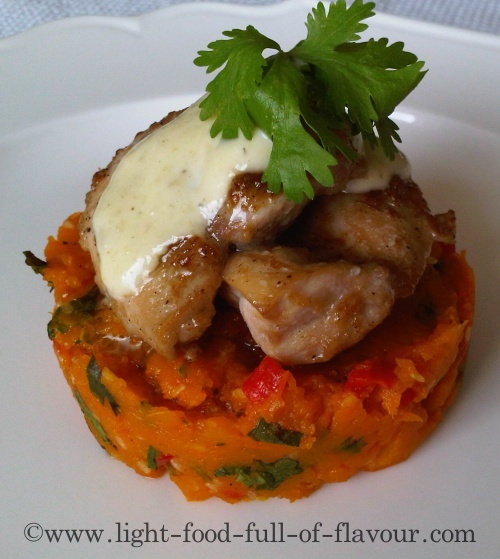 I serve marinated chicken with wasabi mayo and butternut squash and chilli mash instead of a burger bun. It is sensationally delicious! It is really a take on a chicken burger as I don’t mince the chicken meat and shape the mashed chilli-squash into the bottom of a burger bun. And instead of ordinary mayo, I serve my burger with a dollop of wasabi-mayo. You can of course serve the chicken in a bun of some sort. I use moist and juicy chicken thighs and marinate them for a couple of hours before cooking them. If you’ve got the time, you can leave the chicken to marinate overnight, or in the morning if you are cooking them in the evening. I serve theses chicken burgers together with a large salad on the side. 1. Mix together the ingredients for the marinade in a non-metallic bowl. Add the halved chicken thighs to the bowl and mix well. Cover the bowl and leave in the fridge for at least 1 hour – longer if you have the time. 2. Pre-heat the oven to 220C/fan200C/425F/gas mark 7. Place the diced butternut squash and chopped chilli in a roasting pan, add the oil, season with a bit of salt and pepper and toss everything together. Bake in the oven for about 30 minutes – giving the squash a stir mid-way through – until the butternut squash is soft and golden. 3. Take out the chicken from the fridge and place the chicken thighs flat in an oven dish. Pour over all the marinade. When the butternut squash has been in the oven for 15 minutes, place the dish with chicken in the oven as well and cook for about 15-17 minutes, until the chicken is completely cooked through. 5. Use a potato masher to mash the butternut squash and chilli. 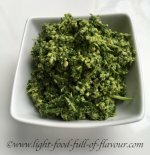 Add the sesame seeds and chopped fresh coriander to the mash and divide the mash between 4 plates. Place the chicken on top of the mash and add a dollop of wasabi mayo on top of the chicken.